Many pests will take refuge in clutter and create worse problems for New England homeowners. Okay, so that’s not really how the old adage goes but just the same it’s true. The clutter that we so skillfully pile up in our attic, garage, basement and other storage areas is likely to become home to opportunistic pests. And, with the holidays just behind us, we’re sure that there is even more clutter around these days. Old toys must be moved to make room for new ones and likewise for new computers; furniture, kitchen appliances… well you get the picture. Now to be fair, we may look at clutter as temporary chaos and resolve to address it during a spring cleanup, but the truth is, all too often homeowners in New England are confronted with pest problems due to an increase in the amount of clutter they acquire through the long winter season. Unfortunately there are many types of insects and rodents in New England that appreciate clutter. After all, clutter provides a place for pests to hide, nest and steer clear of their enemies…mainly you. Mice, spiders and even bed bugs are all of concern when the home has too much clutter. 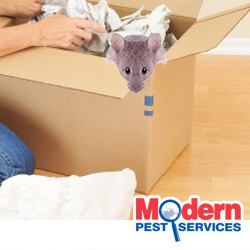 Piles of cardboard boxes, bags of old clothing and stacks of paper are all things that pests use to create their own winter haven right in your home. And worse, we’re usually completely unaware that it’s happening! Spiders can bite when they feel threatened and leave unsightly webs, cause a scare when encountered. Mice chew through belongings, damage woodwork and internal structures of a home, contaminate and/or destroy building materials including insulation, spread bacteria and pathogens via their urine and droppings, and can cause potential fire hazards if they find electrical wiring to chew on. Bed Bugs hitchhike into the home and masterfully avoid detection by hiding out in hard-to-see areas. A room full of boxes and other odds and ends is ideal! When clutter is present, an infestation can become quite severe before there’s a hint of a problem. Bed bugs bite and can leave itchy, red bumps on the skin. They also prove to be quite stressful for some homeowners and late detection may increase remediation costs. Before pests have a chance to wreak havoc in your home this winter, be sure to contact the New England pest control pros at Modern Pest Services. Our home pest control solutions are designed to protect you against all of the common household pests. and we also offer bed bug treatments. So even if certain rooms in your home are looking a little disorganized or just plain scary (we know, it happens), give us a call to make sure you’re not housing pests that love clutter. Modern Pest Services provides safe and effective pest control to homes in Maine, New Hampshire and Massachusetts. Click here to view our New England service area.